Well, I'm back in Asheville and am starting to, finally, feel somewhat recovered from the week of racing that was the Transylvania Epic. Being sick for 5 days afterward didn't help with that process, but racing first. Smiling on Day 7 just a few miles from the finish. a bit of a throwback course. I'd also heard it was hard, like soul shatteringly hard. Given the terrain we'd seen in stages 1-4 I was a little scared. Then we raced. I felt awesome almost from the start, and got in with a good group right after the first big descent. We weren't rallying the singletrack very hard, so I got to the front when I got the chance. Then we headed uphill, and somehow I got a gap on most of the folks I'd been riding with all week. That was pretty much the day. I rode mostly solo, save a few miles in the middle with Rob Spreng, who eventually dropped me. The stage was awesome though. Apparently they reworked it, but the flow was great. 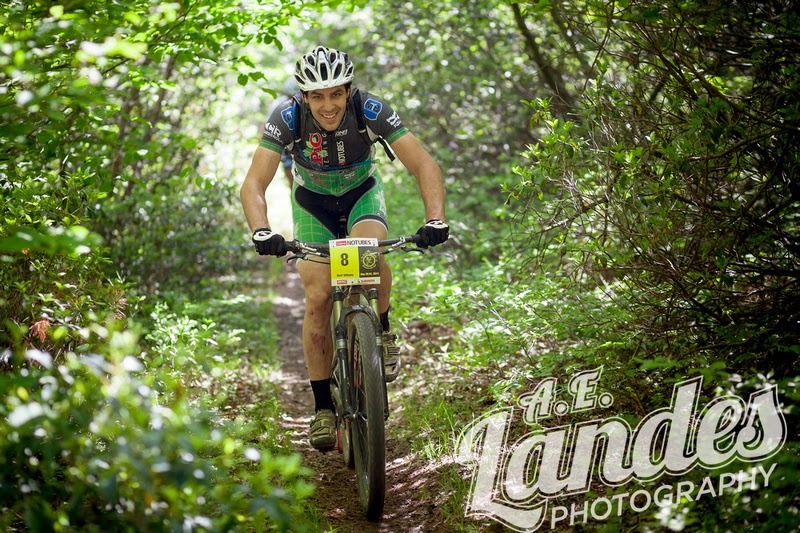 It was a true race course, and then singletrack was super fun. Plus there were like a hundred pizzas waiting for us at the finish. It didn't even matter that it was freezing cold and on the verge of raining. Day 6 was the Queen Stage: Tussey Ridge. It was hard, beautiful, mostly fun, and one of those days when I just couldn't get in the rhythm. I had a decent start, but just had little things go wrong all day. Nothing major, but it was a battle to keep my head in the game. And it needed to be, because there were times our tires touched nothing but rocks for 3-4 miles at a time. Seriously, this stage was for real (really, the whole week was, the this one took the cake). By the end I was spent, but I pretty much stayed were I had been on GC etc. I wish I'd had a picnic for Tussey though. It was cool up there - or a least the few glances I got in between choosing my line through the rocks made it seem that way. For Stage 7 had firm goals for the first time all week: maintain my GC position, and clean the rock garden at the heckle pit. I felt pretty blown when I woke up, and wasn't sure how racing was going to go. Turns out it wasn't so bad. I again got in with a great group for the first 6 or 7 miles, got popped on a climb just before the day's Enduro section, and then rode back and forth with a few folks for the second half of the day. I apparently had enough energy left to clean the uphill rock garden at the heckle pit, and then got to cruise the super fun singletrack all the way back to camp. I was stoked to be done for sure. Seven straight days of racing was pretty eye opening. Mostly, that my body was still up for racing, charging climbs, responding to attacks, etc. on Day 7. It was a different sense of accomplishment from say a 100 miler, but pretty cool to see it through. Sitting around after the agony of stage 2, making all week had seemed a far cry from certain. Of course the summer camp atmosphere was fun, and the racing this year was absolutely top notch. There were so many fast guys, and women, that just trying to hang in was a huge battle. In the end, I was really happy with 16th overall. I drove home just in time to get sick, and then sick again. Apparently racing for a week straight will doesn't leave you with much left over to fight off sicknesses. But, a couple few trips to the doctor later and I'm coming around. Was it worth it, definitely. The whole set-up, the way the stages flowed from one to the next, it was a great race. Thanks to Mike Kuhn and the whole crew for putting on an an awesome event. Hope I can make it again sometime.